Project Scope: Demolition, foundation repairs, mold remediation, site grading, excavation, termite control, storm drainage, asphalt paving, sodding, cast-in-place concrete, masonry units, cast stone, masonry restoration, structural steel, ornamental metals, metal cornice, rough carpentry, wood trusses, finish carpentry, architectural woodwork, cabinets, countertops, dampproofing, waterproofing, building insulation, vapor barrier, shingle roofing, EPDM roofing, modified bitumen roofing, metal wall panels, spray-applied fire proofing, joint sealants, steel doors, wood doors, door frames, restoration of wood doors, access panels, sound control doors, aluminum entrances and storefronts, fire-rated glass and frame systems, aluminum storm windows, restoration of wood windows, door hardware, glass, gypsum board, plaster repair, ceramic tile, acoustical ceilings, wood flooring, resilient flooring, carpet, acoustical panels, paint, signage, fabric awnings, toilet accessories, portable stage risers, audio-visual systems, appliances, musical storage cabinets, window blinds, auditorium seating, asbestos abatement, hydraulic elevators, platform lift, HVAC, plumbing, fire sprinkler, electrical systems. 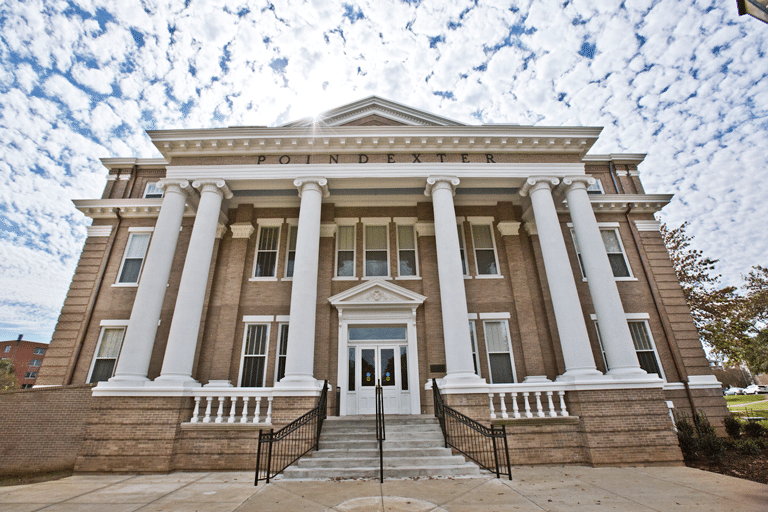 Project Summary: With the use of bond funds issued by the state legislature, the historical restoration of Poindexter Hall, on the Mississippi University for Women campus in Columbus, MS consisted of repairs to the building foundation, exterior masonry walls, interior plaster and wood flooring finishes, and restoration of wood doors, windows and trim, all in accordance with the Mississippi Department of Archives and History. New work was incorporated for proper ADA accessibility compliance, such as restroom facilities, a concrete access ramp and two hydraulic elevators. 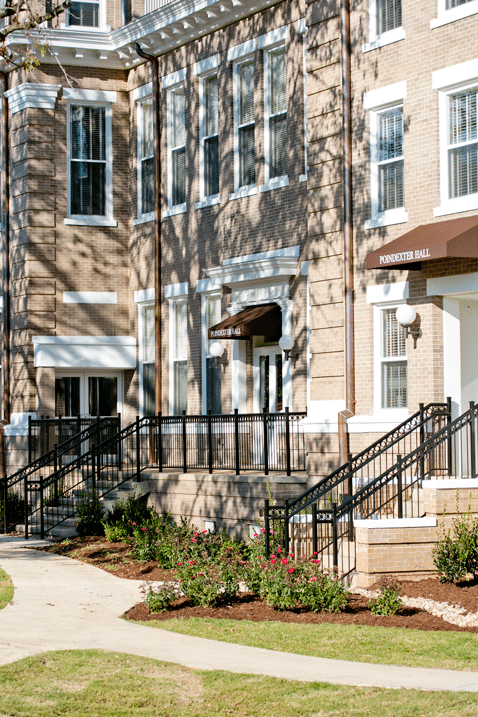 Along with new mechanical and electrical systems, energy management features were also installed, such as a new roof, storm windows, and digital HVAC controls. The blend of audio-visual and acoustical systems and a 250-seat auditorium provide controlled environments for musical programs and instruction. 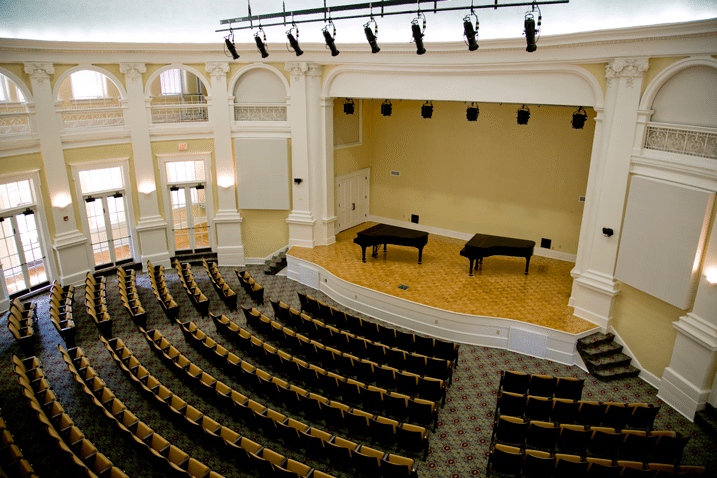 Originally constructed in 1905, the four-story, 27,000 SF “Temple of Music” will remain as 1 of 23 buildings on campus on the National Register of Historic Places, and will serve the campus and community with musical performances and events.